Do people still decorate Easter eggs? When I was a child, we had school projects about decorating. Back then people were less sensitive to differences of culture, at least in my school. So everybody was expected to boil eggs and dip them in food coloring. We also didn’t have video games, so there was less competition for our attention among our young minds. Since I don’t have kids I rarely see an Easter egg up close. But the analogy popped into my mind when I was answering some website questions last week. (1) Websites, like Easter eggs, rarely last forever. …your market has changed. Your followers no longer respond eagerly to the promises you made a few years ago. Sometimes your services become obsolete or attractive only to a specialized segment. — Your business has grown. — You no longer have time to offer services that you made available when you started. For instance, many consultants and coaches no longer offer free “Discovery sessions” to anyone who asks. Some screen prospective clients; offer no free sessions at all. — You added larger-scale services you didn’t know how to offer at an earlier stage. — You want to play on a bigger stage and your website needs to reflect your new role. — New technologies allow you to manage your online presence more effectively. For instance, WordPress used to be the baby chick of the online world. You’d use WordPress for blogs and small, start-up websites. The idea was that you would graduate to a real, full-blown HTML website. The truth is, you can create anything in WordPress that you can create in HTML. I recommend WordPress because it’s so easy to get help. Not only will you pay less for tech support (and you’ll rarely need it), but also you’ll find qualified low-cost resources luring on fiverr.com and other low-cost centers. 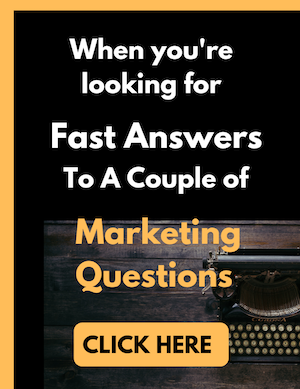 In fact, WordPress is so straightforward that I can offer clients an affordable Express package of a basic website and copywriting – something that was unthinkable at an earlier time. 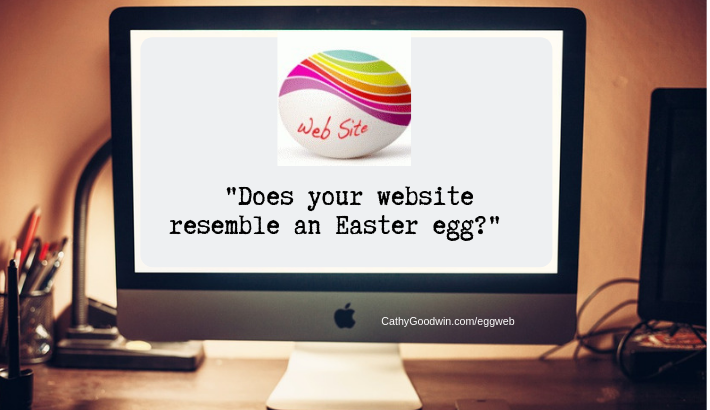 (2) Websites, like Easter eggs, are fun to decorate, so it’s easy to forget what’s under the shell. It’s not hard to find websites with magnificent design and the equivalent of an unsalted hard boiled egg underneath. After all, design is fun! Clients often begin a consultation with, “I haven’t chosen colors yet!” The truth is, you’ll find your colors and logo as you create the content and work with more clients … effortlessly. (3) Websites, like Easter eggs, can be hidden away and found only during a treasure hunt. The most challenging part of a website is standing out from the pack and getting traffic. Surprisingly, you can get high page ranking and targeted traffic by creating compelling, relevant content. Some of my own sites and pages have landed on page 1 of Google for popular search terms … when I wasn’t really trying. Finally, even when you peel a boiled, fresh Easter egg, you rarely have a meal. You need to supplement with side dishes or whatever people serve with boiled eggs these days (unless, of course, you are a body builder on a very rigid diet – I just met one in my gym). Similarly, your website needs to be part of a strategic plan for online marketing. It’s not enough to put up a site. You need to direct visitors so they can’t help tripping over it, instead of being forced to go on a treasure hunt. You’ll need to think of ways to get traffic. When I work with private clients, often we discover the plan as we create the content. There’s something about creating the copy that makes the rubber meet the road (if you’re following me, you know I love this phrase). Ideas start bubbling. If you’d like to get started, join me for a Story Consultation. Prepare to find some hidden treasure you hadn’t anticipated … even if you’re not looking. Please leave a comment about today’s post and (if you like) share how you’re spending this weekend, with or without a holiday theme. If you don’t see a place to leave comments, just click on the title of the post and you’ll be directed to a page where you can add your own thoughts. You always deliver high value, Cathy! Thanks, Phyllis! Coming from you this is high praise. And I’m glad you like the deals. I want to be known for delivering high value. This is a great post! I particularly like point #2 because business owners are often so concerned about the colors of their websites and so unconcerned about the user friendliness of their websites. Your special deals sound very enticing.